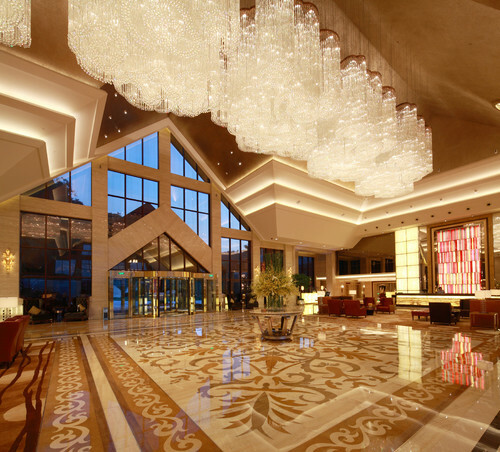 Time for a Redesign: Does Your Hotel Lobby Make a Memorable First Impression? In the same way your clothing makes a statement about your sense of style, a hotel lobby makes a statement about the level of amenities and type of experience guests can expect. 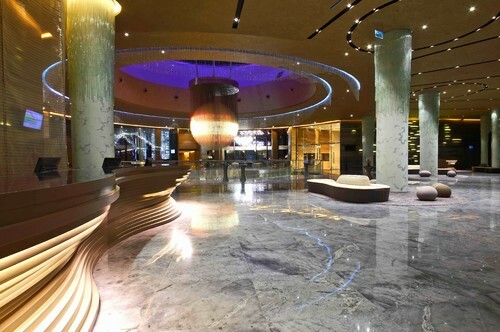 It would only make sense then that the design, comfort, and layout of a hotel lobby is crucial to the overall success of the hotel, though many hospitality professionals may not realize this opportunity to make a great first impression on their guests. Is your hotel lobby an accurate reflection of your high standards and cutting-edge style, or is it time to update and redesign? Primera’s commercial design team brings you some hotel lobby design inspiration for a more inviting hotel lobby that attracts your ideal clientele. A grand foyer, complete with sparkling chandeliers and a gleaming marble floor, greets guests with an elegant, five-star first impression. Travelers are instantly aware that their every need will be met, the service will be impeccable, and the décor and amenities in their rooms will exceed the high standards they anticipate upon check-in. Functionally speaking, the large open space can easily accommodate large groups, so no one feels crowded as bellhops roll by with luggage carts. This is a retreat in which the most sophisticated and discerning clientele can enjoy a luxurious experience during business or pleasure. 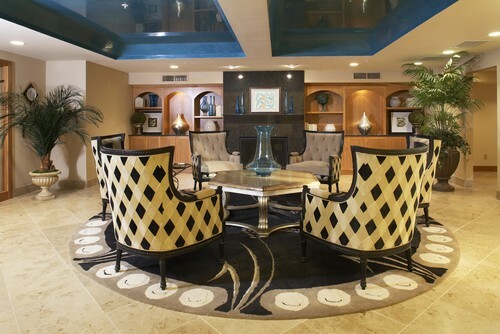 Guests feel warmly welcomed in this eclectic and inviting lobby area. The oversized, round rug beneath individual high-back chairs beckon travelers to make themselves at home in the cozy gathering area. Earthtones on the floor, walls, and fabric are a lovely complement to each other, with a single pop of bold color coming from the turquoise Venetian plaster overhead. This type of hotel lobby décor creates feelings of subtle elegance with an understated air of friendliness and accommodation. When you want to present a first impression of modern, minimal, and state-of-the-art, the clean, cool lines of marble accented by dramatic lighting fit the bill. The futuristic furniture and front desk seamlessly flow along in the room, leading guests toward the cascading, luminescent sphere that emerges from above. The marble columns and high, dark ceiling with dimmed spotlights feels like the inside of a planetarium (or a spaceship! ), adding an air of mystery and otherworldliness to the whole setting. This easy-going hotel lobby design doubles as a gathering space for happy hour and is a perfect option for a casual beachfront hotel or an off-the-beaten-path boutique. The warm colors and soft cushions on the wooden chairs and sofas encourage guests to sit down, relax, and have bite to eat after a day of sightseeing. There’s no rush to leave this reception area, and the come-as-you-are vibe helps guests feel accepted whether they’re wearing shorts and t-shirts, or stylish attire for a night on the town. Natural lighting enhances the unpretentious décor. This classic style provides an upscale, yet casual reception area as a respite for busy travelers. 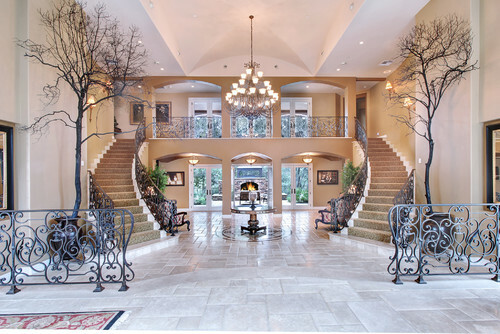 Traditional design elements like the black wrought iron staircase railing carry through to the seating and table. Combined with marble and white textiles, this time-tested décor never looks too pretentious or too casual. It’s the perfect balance of refined, understated class and distinction. Live plants provide warmth and a touch of nature to this otherwise simply sophisticated space. The Primera Commercial Design Team can help you select elements that will bring your hotel lobby up-to-date with the latest options in tile, marble, cabinets, natural stone, and anything else you need for your next design project. When it comes to hotel guests, it’s never too late to make a great first impression. Give us a call or schedule an appointment to tell us about your commercial design endeavors. Newer PostSafety, Durability, Appeal: What Flooring Options Work Best for Restaurants?